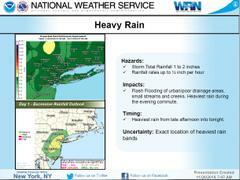 Advisory: 1-2 INCHES OF RAIN/LOCALLY HIGHER. FLASH FLOODING OF URBAN/POOR DRAINAGE AREAS, SMALL CREEKS/STREAMS. RUSH HOUR IMPACT.